Happy Monday! I hope you all had a great weekend! Our week was full of our favorite foods, family time, the girls last dance competition of the season, and finally seeing Dumbo (Olivia is a big fan of Dumbo and has been after her first visit to Disney World back in 2016)! The girls did great at their competition. Both of their teams took home first place! So, I survived my first season of competitive dance mom life and I can officially do the hair and makeup without watching the tutorial videos while I do it. I call that a success! I also am pretty good at applying fake eyelashes to a nine year now, too. I have definitely learned a lot this season and I'm proud of the growth my girls have made! 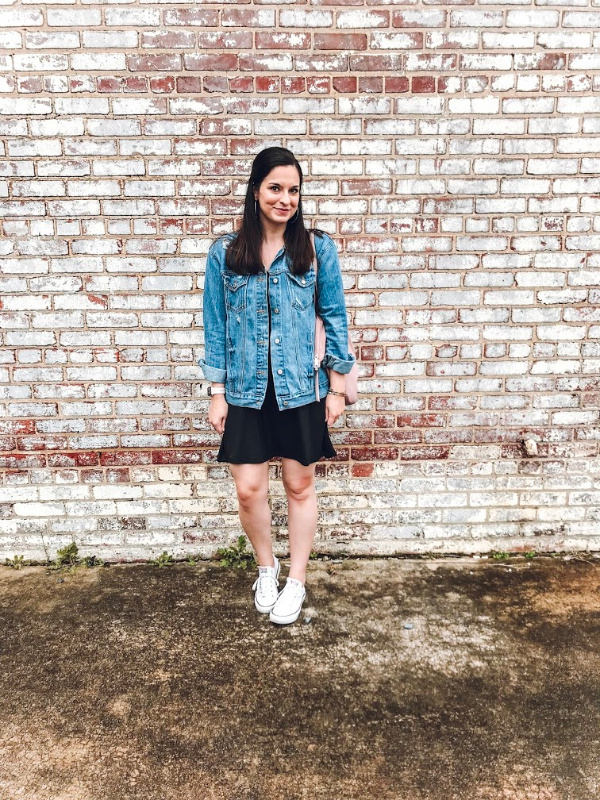 Today, I'm sharing a casual look that I wore on Friday night for an evening in downtown Asheboro. We typically spend most Friday evenings close to home to enjoy some of our great local spots. It had been raining most of the day on Friday and I kind of just wanted to stay home. But, my husband wanted to get out and do something. So, I had to change out of my pajamas pants and get back into real clothes. 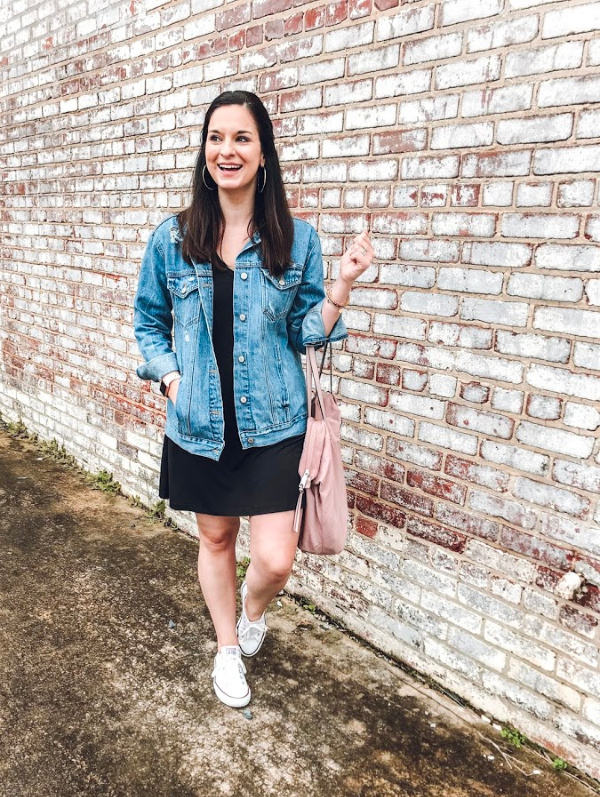 One of my go-to outfit combinations during the springtime when I'm not really sure what to wear, would be a little black dress and a denim jacket. I could probably dig into my outfit archives and find lots this particular combination. 1. It's comfortable and it's easy. This dress is so soft and the jacket fits loosely. 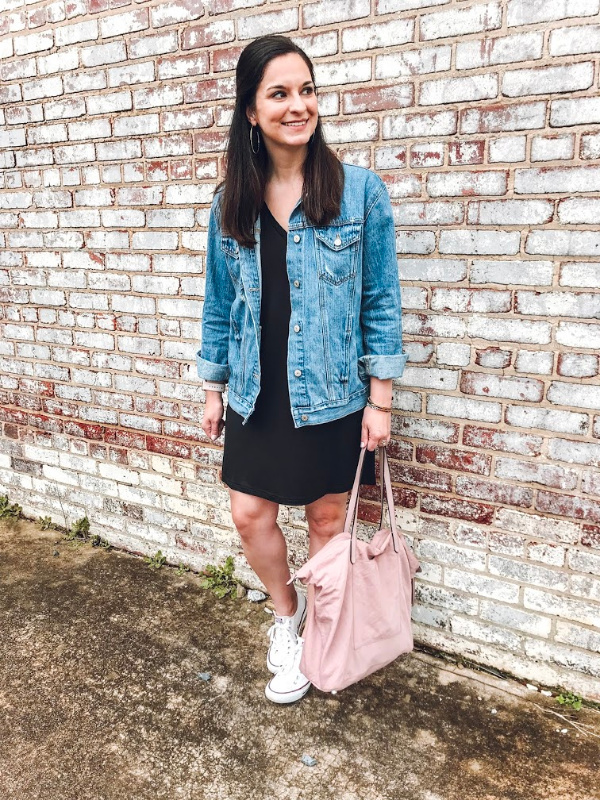 I didn't even really need to think about because you just can't go wrong with a little black dress and denim jacket. 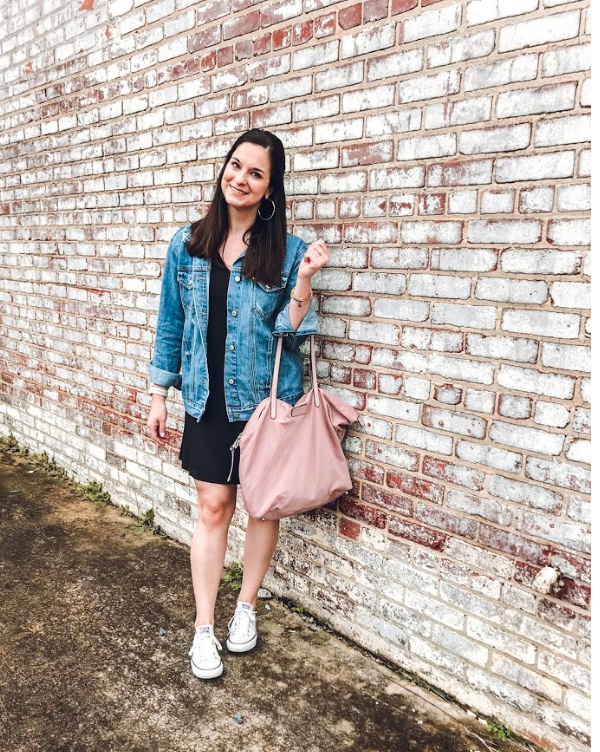 I felt put together while staying true to my casual style! 2. It's classic. 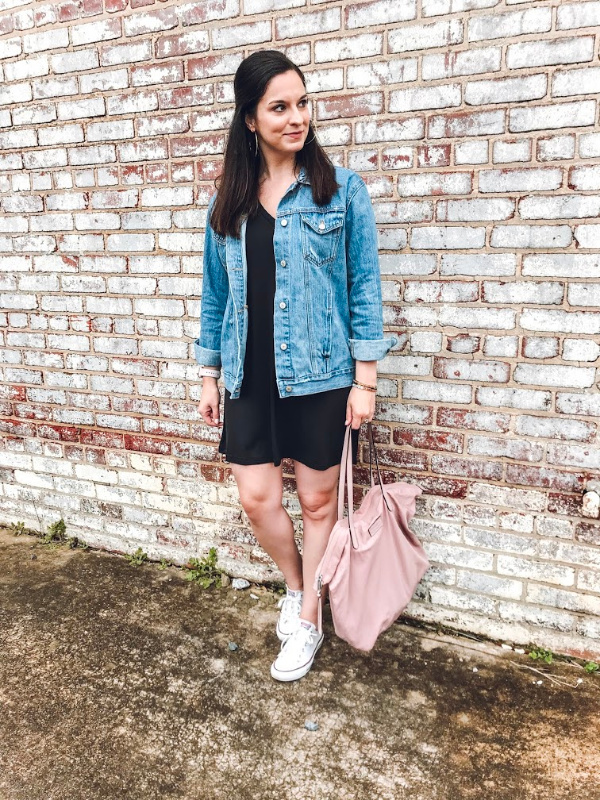 A little black dress (especially of the t-shirt variety) and a denim jacket are serious closet staples. They are timeless and never go out of style! Also, I love pairing this outfit with sneakers for even more comfort. Fun fact: I've owned this same pair of white Converse sneakers for over five years and they are still white. I have two secrets to my success with this: bleach and Scotchgard. After I wash them and let them air dry, I spray them with Scotchgard and it does such a great job at keeping them looking clean. Scotchgard might be one of my biggest mom hacks too because I use it on my kids book bags, lunch boxes, and shoes as well to keep them looking clean on a regular basis! 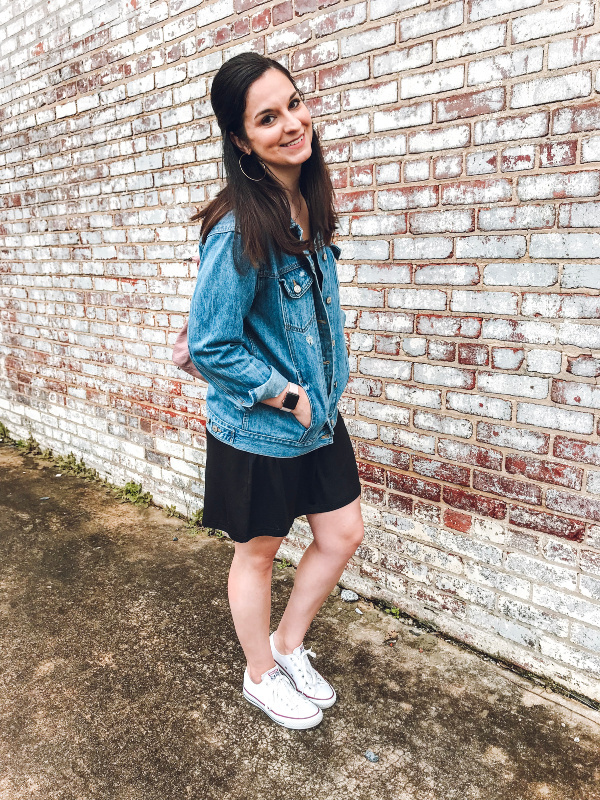 What is your go-to spring outfit?! D R E S S | under $15 and true to size! J A C K E T | I sized up one size. S N EA K E R S | get some Scotchgard to keep them white! 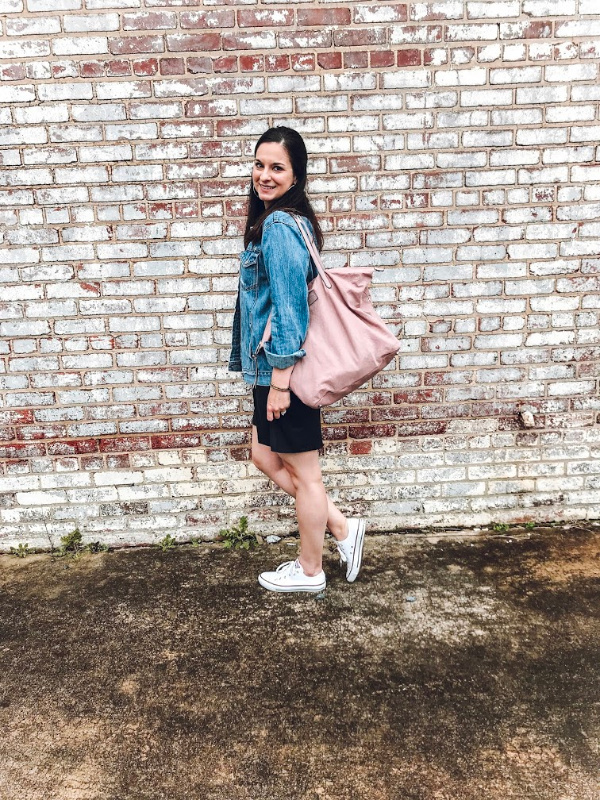 B A G | this bag also makes a great carry on.